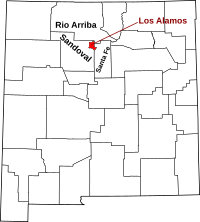 Los Alamos County (Spanish: The Poplars or Cottonwoods) is a county in the U.S. state of New Mexico. As of the 2010 census, the population was 17,950. The smallest county in area of this state was administered exclusively by the U.S. federal government during the Manhattan Project, but now has equal status to New Mexico's other counties. The county has two population centers known as CDPs: Los Alamos (the county seat) and White Rock. As of the 2010 United States Census, there were 17,950 people, 7,663 households, and 5,199 families residing in the county. The population density was 164.4 inhabitants per square mile (63.5/km2). There were 8,354 housing units at an average density of 76.5 per square mile (29.5/km2). The racial makeup of the county was 87.8% white, 6.0% Asian, 0.8% American Indian, 0.6% black or African American, 0.1% Pacific islander, 2.2% from other races, and 2.6% from two or more races. Those of Hispanic or Latino origin made up 14.7% of the population. In terms of ancestry, 18.9% were German, 16.5% were English, 13.2% were Irish, and 6.5% were American. Los Alamos County, New Mexico Facts for Kids. Kiddle Encyclopedia.